Overhead shot of platforms at SEPTA Market East Regional Rail Station, 11th and Market Streets - this photograph was taken from the street level at Market East, as the platforms are subterranean. In order to better view this picture, just click directly on the photo. 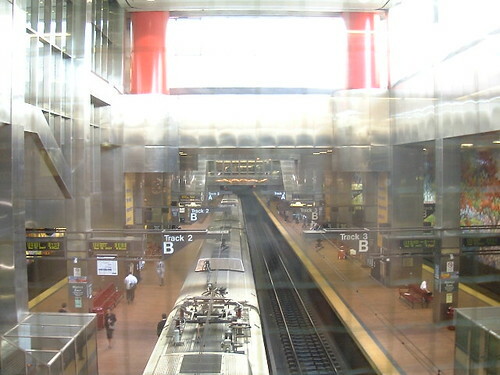 Market East Station is located at 11th and Market Streets in Center City Philadelphia. It is - by far - the closest SEPTA Regional Rail station to the many popular places to visit, in Old City Philadelphia. Accordingly, we've decided to dedicate this page, specifically, to helping you find the best and most convenient method, to get to your destination. Your choices range from SEPTA; the seasonal, purple Phlash Trolley; cabs; on foot; or any combination of the above. While this page is still under construction, we will eventually have the directions and distances from Market East, to all of the major Old City attractions. These are bundled together, as you need to stop by Independence Visitor Center, to obtain a free ticket to visit Independence Hall. Moreover, you'd be best off going to the Visitor Center first, anyhow, regardless of where you want to visit in Philadelphia, particularly if you are traveling here from out of town. They are only separated by two blocks, also. Take the Blue Line from 11th Street, and get off at 5th Street. Independence Visitor Center will be one block away, across the street, at the northeast corner of 6th and Market. You can also take a SEPTA bus eastbound from 11th Street, and get off at either 5th or 6th Street. Generally, we'd recommend the walk, as it's only five blocks away, and it might very well take longer to take the Blue Line or the bus, than it would be to take the walk. From Market East, you can take the Blue Line eastbound, from 11th Street, and get off two stations down, at 5th Street. After you exit the Blue Line, walk one block down 5th Street to Chestnut, and turn right onto Chestnut - and you're there. You walk five blocks down to 6th and Market, approaching the Liberty Bell Center, with Independence Visitor Center across the street. You make a right onto 6th, so that you can see the Liberty Bell, too, once you turn. After walking one block down on 6th, to Chestnut, you make a left onto Chestnut. And once you cross the street, you'll have arrived at the Liberty Bell, which you can see through the window. Independence Hall is on Chestnut, between 5th and 6th. You can take the Blue Line eastbound from 11th Street, and get off two stations down, at 5th Street. After you exit the Blue Line, you just look for the Liberty Bell Center, on that block. It is directly across the street, from Independence Visitor Center. In addition, you can also take any SEPTA bus eastbound on Market, from 11th Street, and watch for either 5th or 6th Street. As with Independence Hall and Independence Visitor Center, we generally would recommend walking, as the hassle of dealing with tokens and the time would likely be greater than just doing the walk. (Note: tickets are not required to enter the Liberty Bell Center - only Independence Hall requires them.) You would get there the same way. Take the Blue Line eastbound to 5th Street. After disembarking from the Blue Line, head north on 5th Street for one block, to 5th and Arch. You'll see the Constitution Center, which is located at 525 Arch Street (it takes up an entire block, on Arch between 5th and 6th Streets). You can also take any SEPTA bus heading east on Market Street, and disembark at either 5th or 6th Street, turn left, go north on one of them, and you're there. Unless there's unpleasant weather (rain, snow, extreme cold or heat), we'd recommend walking to the Constitution Center. By the time the Blue Line train comes, you'd be almost there - and you have to walk a block up anyway. Essentially, to save a five block walk you'd have to get tokens and wait for the Blue Line. Not worth it. As with the previous attractions, you would board the Blue Line at 11th Street, eastbound. You could get off at either 5th Street or 2nd Street, as the Franklin Court buildings are officially numbered as 314-322 Market Street - it's six of one, a half dozen of the other. Any eastbound SEPTA bus on Market Street will also take you near there - disembark at either 3rd or 4th Streets. Directions on Foot: You just head east on Market Street, and Franklin Court is located on Market between 3rd and 4th Streets. This would depend largely on the weather. Franklin Court, being a couple of blocks further east, makes the Blue Line or the bus more attractive, particularly if the weather is unpleasant. But walking is fine. You can also take the Blue Line from 11th Street, and disembark at 2nd Street. When you leave the Blue Line, make a left turn onto 2nd Street, going north. Walk up past Christ Church, which will be on your left, for one block - you'll be at 2nd and Arch Streets, where you turn left onto Arch. The Betsy Ross House is at 239 Arch Street. You can also take any SEPTA bus, running eastbound. Ask the driver if there is a stop at either 2nd or 3rd Streets. When you disembark, make a left to go north up the numbered street to Arch, and head to 239. If it's during the day - i.e., when the Betsy Ross House is open - we'd recommend the Blue Line or the bus. The Blue Line and buses run more frequently, and will get you there more quickly than walking. In addition, the existence of the 2nd Street Blue Line stop means it's just a block and a half, up 2nd Street. You can take the Blue Line to 2nd Street. After leaving the Blue Line, you'll emerge at the intersection of 2nd and Market Streets. Make a left onto 2nd Street, going north. You'll cross the intersection of 2nd and Arch Streets, and then arrive at Elfreth's Alley. You can also take an eastbound SEPTA bus to 2nd or 3rd Streets, and then follow the directions above. Directions on Foot on Market East - Walk nine blocks east on Market Street, to 2nd and Market, and then walk an additional block and a half north on 2nd, and you're there. As with Franklin Court, it's sufficiently distant that SEPTA is probably your best bet - during the day. However, one of the advantages of Elfreth's Alley per se, as opposed to the Museum, is the fact that it's open 24/7. At night, the Blue Line and the buses run far less frequently - and so you might be better off walking or taking a cab. This is a little trickier, as we're giving you the distance from the train station, to the neon sign, welcoming you to Penn's Landing, at Front (the equivalent of "1st" Street) and Market Streets. But you have to go further, depending on your specific destination within Penn's Landing. Getting there via SEPTA: You can take the Blue Line from 11th Street to 2nd Street (three stops down), and walk one block east, to Front Street. Also, you can take many - although not all - eastbound SEPTA buses on Market Street. Before you board the bus, ask the driver if he/she is going all the way to Penn's Landing, as some stop at Independence Hall, but head back west. From Market East, this trip is about 1.2 miles. If you walk the entire way, it will be about 24 minutes, and 13 blocks. If you take the Blue Line, the walk from the 2nd Street station is 0.5 miles, about nine minutes, and four blocks. But, whether you take the Blue Line, or you walk- the main point is to reach 2nd and Market Streets. you can follow the directions below, which are about another four blocks, making it a 13-block trip, if you walk the entire way. How to get there via SEPTA: You take the Blue Line from 11th Street, eastbound to 2nd Street. Once you leave the Blue Line, and reach 2nd and Market Streets, just follow the directions for traveling on foot, below. As with Penn's Landing, you take the Blue Line to the 2nd Street station. However, instead of going through the Penn's Landing neon sign arch, you'd make a right turn onto 2nd Street, going south. Likewise with Penn's Landing, you can take a SEPTA bus eastbound on Market - but make sure that the bus is going all the way to 2nd - ask the driver before you board. Directions on Foot: As with Penn's Landing, you head east on Market Street, till you reach 2nd Street. But unlike Penn's Landing, you stop at 2nd and Market Streets, and turn right, going south. Two blocks down, you'd pass City Tavern, and reach the corner of 2nd and Walnut Streets You'd make a left turn onto Walnut, and you're now going east toward the Delaware River. You take Walnut so that you can walk over its pedestrian bridge, permitting you to reach the Seaport Museum more easily. You walk down the stairs, the Delaware will be ahead of you, and the Seaport Museum on the right. This is a pretty far walk, so we'd recommend taking SEPTA down to 2nd Street, as it's still a healthy walk, even from there,. Independence Seaport Museum is still half a mile further. It would take about nine minutes, plus going down a staircase (and on the way back, you have to climb it, naturally). If you'd like to return to the Market East Station Main Page, please click here. If you'd like to leave Market East Station to Old City Attractions, and return to the Home Page of Enjoying Philadelphia, please click here.